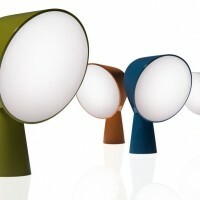 French designer Ionna Vautrin has created the Binic lamp for Foscarini. Binic is the name of a little lighthouse on the coast of Brittany. 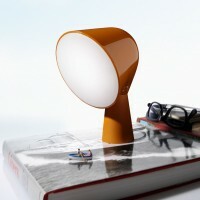 And it is the Breton seafaring world that has inspired this young French designer’s small, fun table lamp. Binic’s curious form recalls the “wind socks” that are used as ventilation systems on sailing ships. 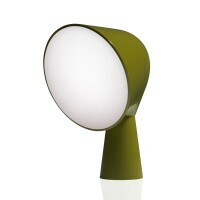 Its odd shape stimulates the imagination to create a wide range of interpretations. 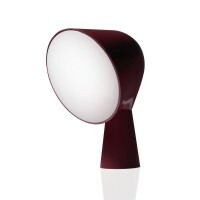 Because of its small size and fun, colorful and unusual shape, Binic evokes immediate affection. Its appeal rests in its impeccable design and great attention to detail. The conical base in satin aluminium creates a pleasant contrast to the shiny polycarbonate projector, enclosed in a simple inclined screen that spreads the light evenly. Binic is much more than great graphic design: it combines functionality with minimal bulk. Vautrin has created an extremely original and up to date color palette which includes rich, dense tones of white, green, amaranth, orange, petrol and grey . Binic thus easily harmonizes with a range of domestic environments – a study, child’s or adult’s bedroom or a personal area in a living room – and is in tune with the personality of whoever chooses his or her favourite version. Binic is suggested as a “take away” object, a present, or a personal object of desire. 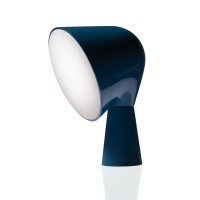 It wins one over through empathy, with a real ‘coup de cœur.’ The character is also transmitted by Vautrin’s packaging which is just as special and fun, and has the same colour as the lamp and its unmistakable shape. 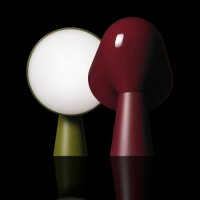 Visit the Foscarini website – here.